Colorado State scored three TD’s in the first quarter, walloping San Diego State football 63-31 in what was likely the Aztecs’ last home game of the season. The loss brings the Aztecs to 9-3 on the year, snapping a home win streak of 10 in the process. The Aztecs couldn’t control the Rams early on; the score was already 42-24 at the end of the first half. CSU wouldn’t stop there, though, scoring three more TD’s in the second. In his quest for the FBS all-time rushing record, Donnel Pumphrey was held to just 53 yards and a touchdown. Quarterback Christian Chapman threw for 183 yards on 11-19 passing with two touchdowns and an interception. 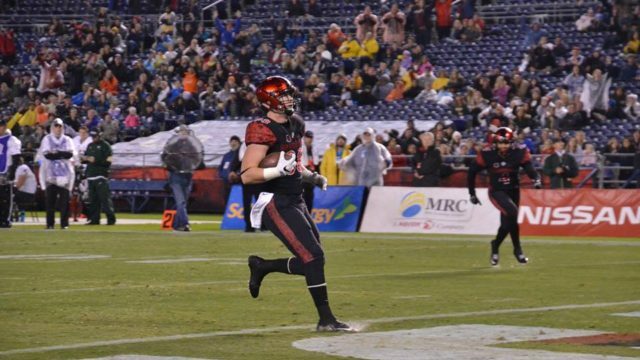 Up next for the Aztecs is the Mountain West Championship game Dec. 3 against the University of Wyoming; after that, it’s off to a bowl game.